Important as individual effort undoubtedly is, there is always a need for organized effort and cooperative work in the promotion of any truth. This fact was early recognized in the Hygienic movement and in 1837 a group of Graham's students founded in Boston the world's first physiological society--The American Physiological Society. Physiology, at that time, was in its infancy and American physiology, in particular, hardly existed. William Beaumont had only a year or two before issued his work on the physiology of digestion. Claude Benard, the great French physiologist, was still unknown, while the German school of physiology was without influence in this country. It is hardly likely that. a society of professional physiologists could have been formed anywhere in the world at that time. The American Physiological Society was formed nearly 50 years before physiologic science had advanced sufficiently to permit the formation of the Physiological Society in England and before a second American Physiological Society was formed in this country. These followers of Graham were not so much interested in physiological research, involving experiments upon animals, as in the promotion of a knowledge of physiology among the laity and the establishment of ways of living based upon physiology. Although it is not known whether Dr. William Alcott attended the first meeting of the Society, he did attend later meetings and became a member. On February 11, 1837, an organization meeting was held at which a constitution was adopted. Many ladies of the Society were of the opinion that the subjects discussed were of too delicate a nature for a mixed audience and thought there was a need for a woman to lecture to ladies alone. Mary Gove, who had but a short time before opened a Graham Boarding School at Lynn, Massachusettes, came forward and offered to fill this position. A Woman's Physiological Society was formed and lectures were given to women, often separate lectures for married and unmarried women. Mrs. Gove's lectures were a great success and continued to be carried on for a number of years, even after the Physiological Society ceased to exist. In 1846 these lectures were published in book form. Two health conventions were held by the American Physiological Society under the general term of the American Health Convention. The first of these opened in Boston, Wednesday, May 30,1838. The second American Health Convention was held in New York under the joint auspices of the American Physiological Society and the New York Physiological Society on May 18, 1839. Physiological societies were formed in several cities, including Oberlin College in Oberlin, Ohio, where Dr. Jennings became a member. Among the other activities promoted or supported by the Society were The Graham Journal of Health and Longevity, edited by David Cambell, numerous tracts on health and diet, the establishment of the Library of the American Physiological Society and a provision store, which may properly be called the world's first health food store. An effort was made to establish a Physiological Infirmary in Boston to provide physiological care for the sick. Although the American Physiological Society of Boston did not last much beyond its first three years, in 1850 the Providence, Rhode Island, Female Physiological Society was still carrying on under that name, and the ladies of Boston were also still functioning as a physiological society. The movement initiated by Graham and Alcott and measurably contributed to by Mary Gove, and which was early joined by Dr. Jennings, represents the beginning of the Hygienic movement. The American Physiological Society numbered among its members in the various cities several medical men, but it would carry us too far afield to list the names of these and it is not known how many of them actually abandoned the drugging practice and confined themselves in the care of the sick to Hygiene. This was only the beginning and many subsequent men, especially Trall, Taylor, Nichols and Jackson, added their weight and thought and their experience to the evolution of the new but old way of life. Writing on the health reform movement in December 1853, Dr. Alcott designates the physiological as distinct from the hydropathic part of the movement. He mentions also that "our periodicals and our books also repudiate as absurd the idea of curing disease," and that "all the elements of hygiene, and these only, are the true materia medica." Alcott lectured far and wide on Hygiene. It is important that we keep these distinctions in mind. The physiological reform had its origin in this country. Hydropathy had its origin in Europe. The two movements mingled and ran along together for a time, but they were separate and distinct and must be understood in this way if we are to grasp in clear outline the evolution of the Hygienic System. In an editorial in the Journal, May 1858, Trall speaks of those "who do not distinguish between water treatment and hygienic treatment," thus setting the two systems apart from each other. When, in 1851, Trall's Hydropathic Encyclopedia was published, it was offered to the public as a "complete system of practical hydropathy and hygiene." At least as early as 1853, Trall's institution was listed as a hydropathic and Hygienic institute. In August 1855 Trall carried the announcement of the issuance of the Quarterly Report of the students of the third term of the Hygienic Institute, 15 Laight St., New York. In an editorial in the Journal, July 1858, Trall declared it to be the only journal in the world which "advocated a strictly Hygienic system of the Healing Art, the only journal in existence devoted to the cause of a universal health education . . ." In April 1862 he issued a call for the formation of a National Hygienic Association, to be made up of Hygienic practitioners, male and female. In 1860 Trall issued a booklet on the Principles of Hygeio-Therapy. 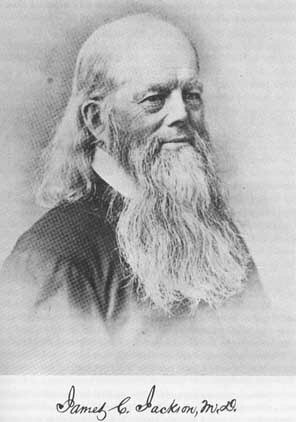 In 1862 Trall delivered in the Smithsonian Institute in Washington his famous lecture, The True Healing Art, or Hygienic Versus Drug Medication. It should be recorded that after this lecture was delivered, there was a heavy demand that it be delivered elsewhere. Complying with this demand, Trall delivered this lecture in several other cities. Writing in November 1873, Trall said that "allopathic physicians could be named both in this country and in Europe who had immediately abandoned the whole drugging system after reading The True Healing Art, and that some of them were then practicing Hygienically." In 1872 The Health Reformer, of Battle Creek, Michigan, published a small work by Trall under the title, The Hygienic System, in which he defined the Hygienic System as "the treatment of disease by Hygienic agencies." Although a small work, it briefly outlines the theory and practice of Hygiene and I should record that it was among the favorite books treasured by Dr. Tilden. Writing in the January 1858 issue of the journal, A. F. Compton, M.D., distinguished between "the allopathic" and "the Hygienic system." Roland S. Houghton, M.D., who never became a Hygienist, both lectured and wrote on Hygiene and hydropathy, one of his books being entitled: Three Lectures on Hygiene and Hydropathy. The preamble of the constitution of the American Hygienic and Hydropathic Association of Physicians and Surgeons, established in 1850, says that "its objects shall be the diffusion of those physiological principles which are usually comprised under the term Hygiene, and the development of the therapeutic virtues of water to their fullest extent, on a strictly scientific basis, and with special reference to the laws of the human system, both in health and disease . . ." Thus it will be seen that at the very outset, this organization made a sharp distinction between Hygiene and hydropathy. A man travelling in Iowa and selling the Water-Cure Journal, stopped at the home of a physician. The physician was out, so the man attempted to sell a subscription to the Journal to his wife. "No," she said, "that's Graham's system. I don't believe anything in it. I've heard of Grahamites that died." I recount this story, not to emphasize the fact that for Grahamism to be good the Grahamites had to live forever, but rather to stress the fact that, both professionally and popularly, the Water-Cure Journal was associated with Grahamism. It was a common complaint against Hygienists that they "dashed Graham into everything." His influence was far greater than the infrequent references to him would indicate. When, in 1853, Trall wrote that "all persons . . . whose living is physiologically bad, may rightfully consider themselves as the particular 'shining marks' at which Death levels his arrows," he wrote after the theories of Graham, not those of Priessnitz. When people discontinued the use of tea, coffee, tobacco, alcohol and animal foods, they were following Graham and Alcott, not Priessnitz. Writing on what he called "A Chapter of 'Water-Cure,'" in an article published in the September 1851 issue of the Journal, E. Potter, M.D., begins by saying: "Six years ago, this past winter, I commenced the study of Dr. Graham's 'Lectures on the Science of Human Life.'" Then he tells briefly of his previous mode of living, his suffering and his use of drugs. Immediately after reading Graham, he made several radical changes in his way of life and he says: "I never felt so well in my life." Potter says that sometimes he strayed from the Graham System and that when he did so, he never failed to experience a physiological impairment proportioned to his departure. He tells us also that he had ceased to use drugs and that he had no occasion to use them. If this was a chapter on "water-cure" as understood by the practitioners of the time, what justification can be offered for crediting the man's changed way of life and changed practices to the reading of the work of Graham? Certainly, Graham's work was not a water-cure work and was published before the water-cure was introduced into America. A woman, writing in the Journal 1854, of her experiences with both allopathy and hydropathy, frankly acknowledges her debt to Graham, whom she had known personally and who had visited her home, and to his teachings and thought of Grahamism as a part of hydropathy. In discussing the "Theory and Practice of Medicine," in the Journal, November 1858, D. A. Gorton, M.D., quotes approvingly from Graham's Science of Human Life. In the January 1861 issue of the Journal, Trall replies to a series of questions asked by a sick man, under the title, "Physiological Living," this taking us back to Graham. In the February 1861 issue of the Journal is an article under the title: "Rearing Children Physiologically," which also takes us back to Graham. Writing in 1850, Thomas Low Nichols, M.D., said: "Sixteen years ago, while attending medical lectures at Dartmouth College, when Dr. Muzzy, the eminent surgeon, was a professor in that institution, my attention was directed to the influence of diet and regimen, and I adopted, as an experiment, what has been commonly, but very improperly, called the Graham system of diet; for if the system is to be named after any man, it might with much greater propriety be called the Pythagorean, or even the Adamic. A system practiced by the primeval races of mankind, by many of the sages of antiquity, by the wisest and purest men of every age, and by a majority of the human race in all ages, surely ought not to receive the name of a modern lecturer, who, whatever his claim to zeal and science, can have none to originality." This does not tell the whole story. As a result of listening to the lectures of Graham, young Nichols abandoned the study of medicine and became a newspaper reporter. Several years were to pass before he resumed the study of medicine, this time in New York City, which he was never to practice. After graduation, he established himself in what was called a hydropathic practice; but it was in reality a combination of Hygiene and hydropathy. This practice he was to continue for the remainder of his life, until his retirement at an advanced age. The force of Nichols' argument is patent to all, but it should not be overlooked that it was largely due to the zeal and original thinking of Graham that this plan of eating was revived in America and even in Europe. What is even more to the point is the fact that the Graham System was and is vastly more than a system of diet and that he may justly have laid claim to much originality of thought. It is to his credit, also, that he based his dietary plan on physiology and comparative anatomy and not, as did Pythagoras, upon a belief in reincarnation. Graham did not believe that animals housed the souls of men and women who had died and that, for this reason, to kill an animal is murder. 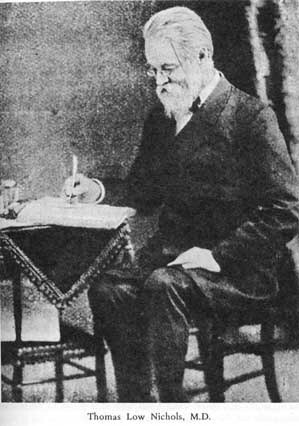 Graham was not unaware of the water-cure movement and of the association of physiological reform with the movement, and was a regular reader of the Water-Cure Journal. In a letter published in a Northampton, Massachusettes, paper, where Graham lived, Graham endorsed the journal as "one of the most valuable publications in our country." This letter was reproduced in the Journal of March 1851. It is not to be accepted as an endorsement of hydropathy. At a previous date Dr. Jennings had endorsed the Journal, but Jennings was very outspoken in his opposition to hydropathy. The fact is that the Journal carried more information about Hygiene than it did about hydropathy. Writing in the Science of Health, July 1873, Mrs. Julia A. Carney tells some of her experiences, as a young girl, with Graham and the Graham System. She mentioned that, for many years, those who "would not accept the gospel of Hygiene which he preached," called him "maniac," "fanatic," and "fool." She tells us that: "When as a mere child, scarcely yet in my teens, I often saw Dr. Graham at the house of a friend, the senior publisher of his 'Science of Human Life.' He was then engaged in superintending the passage of this work through the press, and I first read it in the original manuscript. Receiving from the author a large share of attention and petting because of a real or fancied resemblance to some young friend (his own daughter I think), perhaps also from the eager interest with which his new theories inspired me, my juvenile mind then received its first impressions of Hygienic reform. "While, therefore, not believing all of his opinions entirely correct, nor strictly complying perhaps with all I do perceive, I am yet indebted to his works, and others which I was induced to pursue by the interest thus awakened, for an incalculable amount of good. 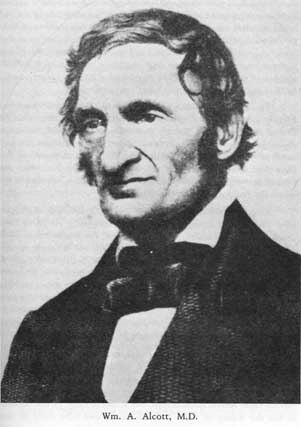 "For, although my physical constitution, if I ever had any, had been poisoned by as large an amount of allopathic drugs as ever fell to the lot of mortal child to swallow, and survive; yet, thanks to 'all kinds of strange notions,' then imbibed, I soon regained a degree of health quite unexpected to my anxious friends, many of whom were thus induced to examine the 'notions' more impartially. From a complimentary copy of his 'Lectures, etc.,' received at that time and preserved until now, perhaps because to my young mind complimentary copies of new books involved new experience, I quote as follows: . . ."
These references to Graham and Grahamism are but a few of many contained in the Journal and in the Science of Health which indicate the strong influence that Graham exercised in the movement. Many more such references could be quoted, but these are sufficient. Inspired by the temperance movement, in which he had been an active worker, Graham wanted to know why temperance should be limited to alcohol. With this question in his mind he delved deeply into the subject and came up with answers that have proved very satisfactory for millions of people. Under the vivifying influence of Grahamism, new ideas rapidly emerged. The medical historian, Richard Harrison Shryock, says in The Development of Modern Medicine (University of Pennsylvania Press, 1936), of Graham's crusade for physiological reform: "Personal hygiene was an old story, but carrying it to the people with the fervor of a crusader was something relatively new." He credits Graham with sincerity, but limits the existence of what he calls an "articulate hygienic cult," which grew up around the name of Graham, to the decades from 1830 to 1860. Somewhat contradictorily, he says that the most effective means of reaching the public was the "health papers," of which he says some 80 appeared in the United States from the year 1830 to 1890. He says of these "health papers," most of which were ephemeral, that "their cumulative influence may have been of some significance," for, he adds: "Certain it is that their publication coincided with an improvement in the hygienic habits of the American people." Perhaps in an effort to cast a slur at Graham, Shryock says that Graham established "Ladies Physiological Reform Societies," but makes no mention of the Physiological Reform Societies that were composed of men. He would seem to be trying to make it appear that Graham was preying upon "gullible women." I do not want to be unfair to Shryock, who is the only medical historian of whom I know who has favorably discussed Graham and his work. If I have misjudged his intent, it is only because it is a general rule of medical writers to attempt to discredit Graham. Medical deprecations of Graham's work began very early. One Dr. Bell wrote a Prize Dissertation on Diet, in which, while presenting the generally prevailing public and professional view of the subject, he took advantage of the occasion to castigate Graham. He reduced Graham and Grahamism to smouldering ruins with such matchless and devastating logic as "eutopian dreamers," "modern empirics and modern innovators," "self-conceited and opinionated dogmatism," "visionary novelties," "new sect of fanatics," "men of erratic and visionary genius," "modern Pythagoreans," "bigoted exclusives," etc., etc. The first annual meeting of the National Health Association was held in Caneserage Hall in Dansville, New York, in the evenings of the two days of September the 14th and 15th, 1859. Arrangements were under the immediate auspices of Dr. James C. Jackson and his associates. Dr. Trall served as chairman and proceeded immediately, upon taking the chair, to explain the fundamental and radical differences between the Hygienic System and the systems of drug medication. The convention unanimously elected Dr. Trall as president of the Association for the ensuing year and elected 29 vice presidents from states as far apart as Maine and Texas, Vermont and Utah, New Hampshire and Mississippi. At this convention it was made clear that "to restore the race to its primitive condition," of health and vigor, it is necessary to unfold and demonstrate the principles of Hygiene and to wean men and women from the ancient pill box and drug shop. It was noted that the spirit of inquiry on the subjects of health and disease had been awakened and men were beginning to question the divinity of disease and to wonder if health is not of God. Should health not be the rule and disease the exception, they asked. The necessity of studying the laws of life and their relation to human health and happiness in the practical application of these laws in our daily life was stressed. This was not the beginning of organized effort to promote Hygiene, but it marked a mile-stone in the progress of the new movement. It is a matter of satisfaction to the author that he can record that there has been an uninterrupted effort to promote the principles and practices of Hygiene down to the very time he writes these words. If you ask: what has the Hygienic movement accomplished during the years of its existence--what have we to show for our labors? we answer first by asking a counter question: "what has been accomplished by the false cures and fraudulent treatments?" What have the other schools to show for the compromises they have made, for their betrayal of the real principles of Hygiene? How have the sick profited by their desertion of truth? Their one positive achievement has been to obstruct the growth of a genuine revolutionary health movement. But let us answer the question. Millions of pages of tracts, books and magazines have been broadcast over the land, almost over the world; indeed, thousands of lectures have been delivered; many Hygienic practitioners have been created to serve the people and these covered much of the land and all grades, conditions and ranks of society have been reached and people by the thousands have turned to Hygiene and flown from drugs. Great armies of invalids have been restored to health and the average life-span has greatly increased. All of this influence countered the poisoning practices of the medical profession and led to the permanent adoption by all of the people of some of the Hygienic System. The people have learned to bathe, to eat more fruits and vegetables, to ventilate their homes, to get daily exercise, to avail themselves of the benefits of sunshine, to cast off their fears of night air, damp air, cold air and draughts, to eat less flesh; they have adopted better modes of food preparation. It is true they have forgotten who it was that promulgated these things; they have lost the record of the tremendous opposition to these things that the medical profession offered. They believe that the medical profession was responsible for the decline of disease and death, for the decline of the infant death-rate, for the inauguration of sanitation, and for the increased average life-span. They believe this because the medical profession, controlling the media of communication, has indoctrinated them with the idea. Neglect of the Hygienic needs (especially of the need for rest, fresh air and water) is not as persistent nor as criminal today, thanks to the work of Hygienists, hydropathists and nature curists, as it was a hundred years ago; but the total Hygienic program is far from having been accepted. By line upon line, precept upon precept and volume upon volume, the workers for a revolution in the way of life have done a good job. Jackson declared that the changes in medical practices that occurred during his lifetime had been due "clearly and wholly to the promulgation of the principles" of Hygiene. They had come about, he said, during the period that he and Dr. Trall had been "recognized as Hygienic practitioners." "For half of a life time of an entire generation," he said, "has this Journal (the Water-Cure Journal ) been the advocate of the Hygienic theory of treating disease." Let it not be said that medical schools were quick to adopt the principles and practices of Hygiene. In The Science of Health, March 1873, Trall quotes the following statement from an article on "Medical Schools" which appeared in the New York Medical Record: "The principles of Hygiene, too, with sanitary laws, should have appropriate places in our systems of education." Then referring to the importance of Hygiene and sanitation and pointing out that medical men in general were ignorant of them, Trall asked: "Where, among the one hundred and fifty medical colleges of the civilized world, is there a chair of Hygiene or a professorship of sanitary laws?" Answering his own question, Trall replied: "Not one can be found except in the Hygeio-Therapeutic College and this is not regarded as 'regular' by the regular profession." He says that "soon after the establishment of the 'Hydropathic and Physiological School' in New York some twenty years ago, a chair of Hygiene was introduced in the principal medical college of New York, and professorships of hydropathy were introduced into three Eclectic colleges. But the chair of Hygiene soon ran out, and has been vacant ever since; while the professorships of hydropathy all ended at the end of the first college term-in one instance in mid-term. Why these chairs could not work harmoniously with the others, the reader need have no difficulty in imagining. It was soon discovered that the Hygiene was ruining the materia medica, while the hydropathy was drowning out all the druggery." Trall regarded the plan proposed by the Medical Record as both "revolutionary and ruinous." He said that its adoption "would in a few years close three-fourths of all the medical colleges on the face of the earth, and destroy nine-tenths of the medical practices of the world." It would, he added, also "be very damaging to the business of the Hygienic physicians everywhere, for as things are now, three-fourths of their business consists in treating invalids for diseases which the medicines of the drug systems have occasioned." Medical colleges and the medical profession were not only neglecting Hygiene, but their practices were producing so much iatrogenic disease that Hygienic practitioners were kept busy trying to repair the flood of damages that flowed from the drug-satchels of the physicians. With their lancets, their pukes and purges, their blisters and their stimulants, in a word, with their poisons, they were busily engaged not only in disease producing, but in killing their patients. Without poisons the minds of the medical men would be blank, so far, at least, as their treatment of their patients is concerned. Poisons are almost their sole stock in trade. Poisons legitimately belong to them and we will let them have them. We have no need for them. We have a broader basis of action and in comparison with which, theirs sinks into insignificance. Let them have their cherished illusions along with their indispensable poisons; but let the people, who have to suffer the consequences of the poisoning practice, emancipate themselves from its control. To them, the poisoning practice is not a messenger of life, but of disease and death. The truth of this is contained in every medical report that is issued. Quietly, and at different places, the details of the application of the great principle of employing only the normal things of life in the care of the sick is working its way into the consciousness of the people and a complete system of Natural Hygiene is about to dawn upon the world. The doctrines of the Hygienic System are new. Its principles and the application of these principles have now been before the world but a century and a quarter; and, although a comparatively few persons have studied its basis and mastered its fundamental premises, and many have obtained some general knowledge of its application, the majority of the people really know little about it. Beginning with Graham's lectures and the publication of the Graham Journal of Health and Longevity, the Hygienic movement pushed forward with vigor and enthusiasm. As early as 1850 the Water-Cure Journal had a circulation of 18,000. Wherever the journal circulated there was invariably an improvement in the Hygienic habits of the people and a corresponding decrease in the fatal cases of disease and an immense saving to the people. So vigorous was Hygiene promulgated and so great was the enthusiasm with which the people accepted it, it was estimated in January 1852 that the practitioners of the two and somewhat commingled schools--hydropathy and hygeiotherapy--outnumbered the practitioners of any of the medical schools--allopathic, homeopathic, eclectic and physio-medical--in this country. One does not get a true picture of this situation, however, unless one understands that many of the hydropathists also used drugs and that an occasional Hygienic practitioner was not above a "little drugging" now and then. So vigorous was the drive against the drugging systems that the medical laws were repealed in a number of our states. During this period when the powers of the state could no longer be used to deprive people of their right of private judgment in their choice of modes of care, medical societies were formed by groups who voted themselves the "salt of the earth," the "regulars," etc. These organizations were intended to influence and mold public opinion and let the world know who were the regulars, who was scientific, and who were the quacks and empirics. Medical schools conferred the title Doctor of Medicine as a part of the move to create a select monopoly; medical journals, medical societies and lecturers endeavored to suppress all empiricism, while they wrote and declaimed against "quackery" until the very word became odious and quack became a synonym for a knave or a fool. Medical societies mistook their function when they endeavored to put down all plans of care of the sick but their own. When assembled for the purpose of free discussion of medical subjects, for the collection of facts, the establishment of principles and the investigation of new truths, they are useful auxiliaries to the cause of progress; but when they do little more than regulate the rate at which each member shall bleed, blister, purge and tax, or transfuse, inoculate, operate and tax, and the particular courtesy that they shall extend towards each other and how they shall treat the outside "barbarians," they fail in any worthwhile mission. The establishment of a mode of medication by the state is an infringement upon one of our most precious rights and an injury to the cause of truth and the progress of science. Such an establishment never can suppress empiricism; for when all other systems have been suppressed, empiricism will flourish in the one allowed. The state has no more right to establish one school of medicine above others than it has to establish one church above all others. It is important that the people shall be free in their choice of means of care and any curtailment of this basic freedom is tyranny. So far as medical colleges teach science, they travel in the right direction; but when they desert science and teach an empiric mode of medication and give to their arts an air of mystery, they serve neither God nor man. So long as medical colleges promulgate the superstition that drugs have curative power, they will continue to be curses to the race. Naming diseases in two or three ancient languages is but a camouflage for ignorance. Writing prescriptions in a language which their patients cannot read serves to confuse the minds of the people. When the medical colleges contribute to and give countenance to these mysteries, they do not serve the cause of science and human advancement. Could the colleges of medicine confine themselves to the teachings of the sciences that are connected with medicine and to seeking to erect a mode of practice upon these as a basis, they could become worthwhile institutions; but so long as they continue to mystify disease and to teach that it can be cured by poisons, they not only reject science, but they aid and abet the patent medicine industry.